Usually when I quote, “Eat us! Hey it’s Thanksgiving Day!” very few people know what I’m talking about, so I thought I would share the actual clip from the movie Addams Family Values. For all the family and friends who were apart of our wedding. I couldn’t have asked for more of a special day. Today I celebrate because I get to enjoy the many blessings God has given. Having the gift of being surrounded by the love of my family. Another reason I rejoice is the wonderful sight of a table full my favorite foods. Knowing that I have so much to give thanks for makes me feel blessed. Sometimes I may not be satisfied, but today I realize I am rich because I have. Great blessings I have been given that can not all be listed. I have life, am loved, have all I need, and I live in country that is proud to be free. Very many people would love to be me. Instead of comparing myself I will give thanks and pray. Never will I take for granted what I have been given each day. Great is Thy faithfulness and thanks I give today! Happy Turkey Day everyone. 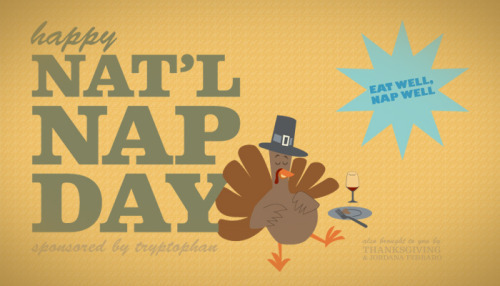 Eat lots, then nap.